Esedoglu, S.; Shen, J. Digital image inpainting by the Mumford-Shah-Euler image model. European Journal of Applied Mathematics. 13 (2002), pp. 353-370. Bertozzi, A.; Esedoglu, S.; Gillette, A. Inpainting by the Cahn-Hilliard equation. IEEE Transactions on Image Processing. 16:1 (2007), pp. 285-291. Bertozzi, A.; Esedoglu, S.; Gillette, A. 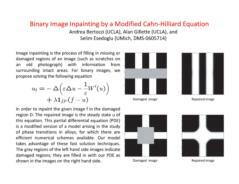 Analysis of a two-scale Cahn-Hilliard model for image inpainting. SIAM J. Multiscale Modeling and Simulation. 6:3 (2007), pp. 913-936.